Track, organize, and report on testing activities across the enterprise with scalable, in-sprint test management for open source test automation, exploratory testing and BDD. Embed quality across the software delivery pipeline and drive transformation with test management built for Agile. 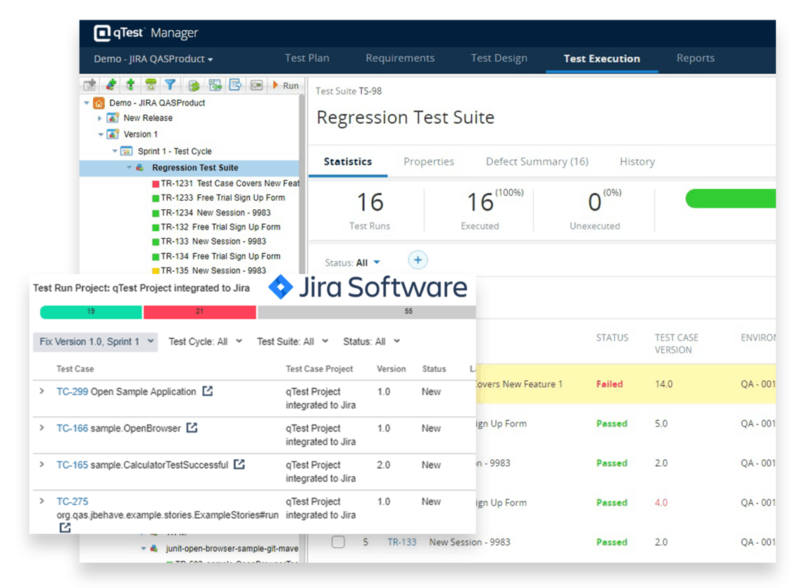 Standardize testing across projects and hit software delivery targets with easy-to-use test management built for agile teams. qTest Manager’s UI is built for fast test run planning and test execution without limiting how these runs are organized into releases, cycles and test suites. qTest is designed to scale as your organization grows, with enterprise-grade functionality, flexibility, reporting and administrative features. Streamline workflows and align testing with development with real-time, two-way updates at the defect and requirements levels. Whether you’re migrating from legacy tools or importing Excel spreadsheets, qTest provides a simple migration path that won’t affect testing timelines. Clean up the clutter with a test management platform that makes creating, editing and auditing scripts easy. Organize all test cases in a single location and create logical categories for execution, such as new feature, regression and application areas. Create and version test steps that can be called into common scripts to streamline test case creation. Keep your library up-to-date with a single point of maintenance for all test driven data with parameter data management. Assign administrative rights at the user or group levels to ensure testers and other stakeholders have access to the correct projects and information. LDAP integration simplifies user management and offers a single-sign on experience. Customize qTest Manager at the project and artifact level to fit your organization’s testing processes. Leverage custom field types, system values and formats — including support for worldwide date formats. Make certain fields required to ensure the correct information is logged. Customize event notifications to keep testers up-to-date but not overloaded. Manage and track manual, automated and exploratory test cases, and execute all test runs across multiple projects and tools from a central location. Easily create and reuse test plans, and log defects against agile planning tool requirements. Intuitive organization options provide a clear representation of the work you need to accomplish. Use the quick run feature to batch-assign run status. leverage the test pad to streamline test step execution. Ensure your team is always using the right test cases with approval workflows and tracking. qTest supports test case edits during test execution and reflects the changes in test design. Version control tracks history and notifies testers when new versions have been approved. With qTest, always know what test case version failed, and track which versions were approved and executed. Maximize efficiency with a powerful, flexible test case library. qTest Manager’s tree structure view allows for effortless movement of artifacts from folder to folder and copying to other projects — simply drag and drop. Maintain project-specific versions for maximum traceability. Clone entire projects for instant templates. Centrally manage, schedule, monitor and scale testing across projects, tools and teams. Integrate across the pipeline, from best-in class enterprise agile planning to test automation and CI/CD tools.